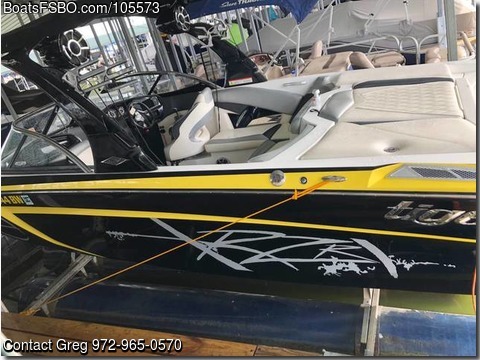 Contact the owner at 972-965-zero five seven zero...Tige RZR Wake, Surf, Ski with low hours in excellent condition. Tige's RZ Series of boats are their top of the line, fully loaded line of boats. The RZR is 20 feet long and weighs in right below 4000 pounds which makes it much easy to trailer. The reason we purchased the boat was due to the trailer-ability (we pulled it with the mini-van) along with the fact that it creates an enormous surf wake, drives like a sports on car on the water, and is an all around awesome boat. The fit and finish of the RZ Series is beautiful with diamond pleated cushions and high quality materials throughout. Nice sounding stereo with two Wet Sounds amps, a 12" subwoofer, large tower speakers and other speakers through the cabin (all Wet Sound Speakers). Cruise control with memory settings for different skiers which can be set to remember each skier's preference for ballast, speed, and tim. Touch screen controls for most functions. Fold down tower for garage storage. The boat is on a lift at Lake Lavon and can be shown by appointment. Similar to the Mastercraft XT20, Malibu Wakesetter VTX, Axis A20, Supra SR, Nautique GS20, Moomba.